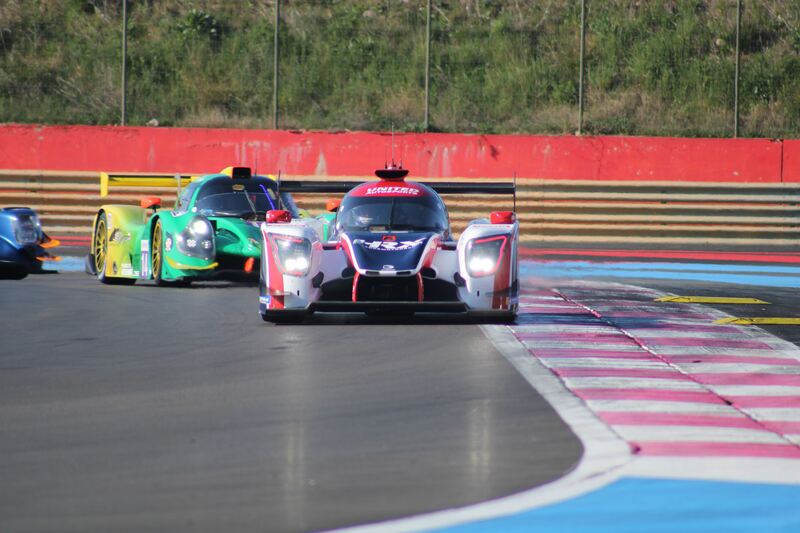 The season opener of European Le Mans Series 2019 turned out to be four hours of good racing and some surprises. Under beautiful, blue sky and 12 degrees Celsius at the start of the race, the 41 cars drove around the 5.770 metres long track, hopefully without as much drama as Michelin Le Mans Cup yesterday, where there were run-offs and all kinds of confusion on and off the track. G-Drive Racing #26 had taken Pole Position in the LMP2 category, Oregon Team #10 took Pole in the LMP3 class, while Dempsey-Proton Racing Porsche #77 was the fastest in GTE. IDEC Sport #27 had problems on the way to the grid and had to be pulled back to the garage, and the mechanics worked on it before the race even started. The team had problems with the gearbox under Saturday’s run, that was why they installed a brand new gearbox. The drama on the warm-up lap didn’t stop there, when Roman Rusinov in the Pole sitting car G-Drive Racing #26 stalled in the middle of Mistral Straight. He could restart the car and came back to the first starting position for the rolling start. Inter Europol Competition #34 pitted just before the start. The team also had been plagued by gearbox problems for the entire week. Fjordbach in High Class Racing #20 did an impressive start and was up to fifth place after a few corners. 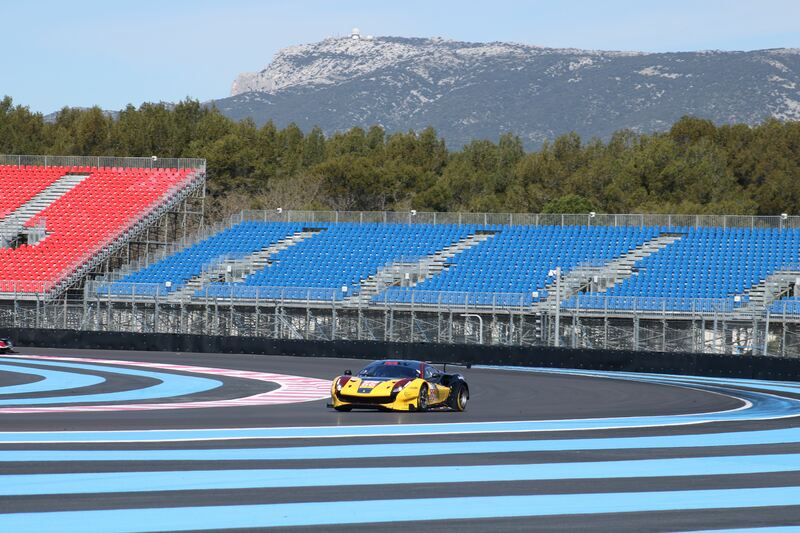 It went even better for Mikkel Jensen in Eurointernational #11, who took the lead in the LMP3 category. 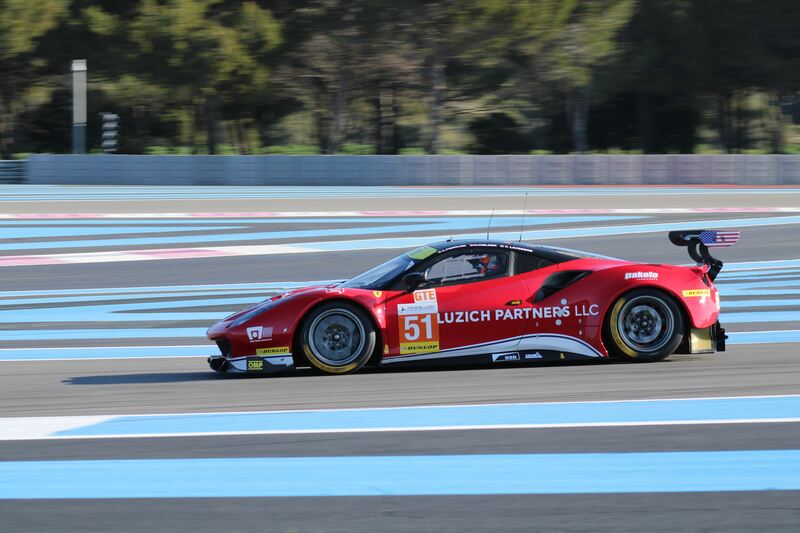 There was also a change in GTE, where Fabien Lavergne in Luzich Racing #51 took the lead. Phil Hanson in United Autosports #22 was about to lose control of the car at the start of the second lap, where he attempted to get past Alexandre Coigny in Cool Racing #37, but he managed to stay on the track. Fjordbach went up to fourth, when he dived past Ryan Cullen in United Autosports #32. James Allen in DragonSpeed #21 overtook Paul Lafargue in IDEC Sport #28, and began chasing Rusinov in G-Drive Racing #26 in front. Algarve Pro Racing #25 with Andrea Pizzitola was millimetres away from hitting Kessel Racing Ferrari #60 with Claudio Schiavoni, but both cars could get through the corner. Fjordbach had a bad lap, where he lost three positions in a short amount of time, but he went back up in speed. James Allen in DragonSpeed #21 took the lead with a fantastic overtaking from the outside in the penultimate corner, where Rusinov partly caught up behind Egidio Perfetti in Team Project 1 Porsche #56, something that Allen used to his advantage. Ryan Cullen in United Autosports #32 brushed Fabien Lavergne in Luzich Racing Ferrari #51, where the latter lost a mirror on the right side of the car, and #32 bent its exhaust pipe. Pizzitola in Algarve Pro Racing #25 had drove himself up to third place, and put a pressure on his old team from last year: G-Drive Racing. BHK Motorsport #35 got a Drive-through penalty for jump start. There was a bit of panic in the midfield under the start because #35 was a little too fast. G-Drive Racing #26 lost not only second place to #25 but also third and fourth place to IDEC Sport #28 and Duqueine Engineering #30. Ebimotors Porsche #80 and Kessel Racing #60 had a near collision on the way to Turn 1, where #80 overtook from the inside and Schiavoni in #60 tried to hold on around the outside, but instead he spun around on the dirty part of the track. Wei Lu in JMW Motorsport Ferrari #66 and Christian Ried in Dempsey-Proton Racing Porsche #77 had a light contact through the fast Turn 8, where both cars had to use the run-off area. Shortly afterwards #66 also went up behind Team Project 1 Porsche #56, which he immediately attacked and went past. The first pitstop round started after 40 minutes into the race, where some of the teams also swapped drivers. It changed the order in the field, when the faster or slower drivers took over the car. 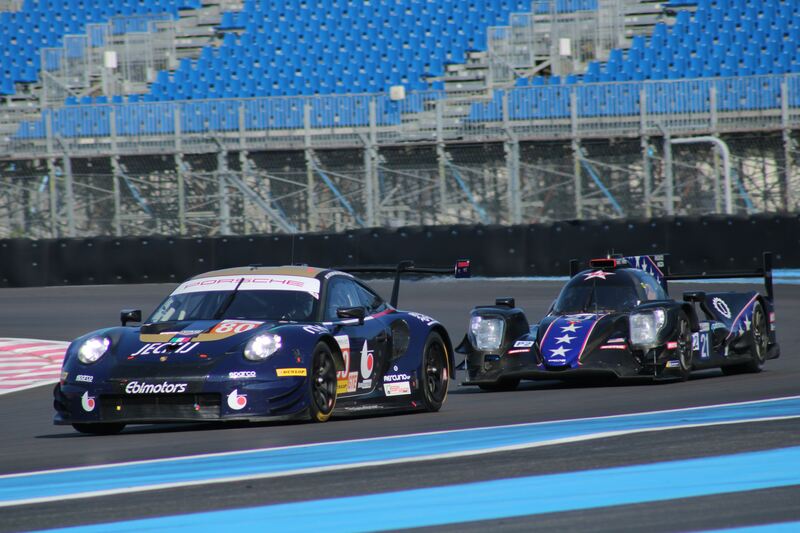 Bronze-rated driver Henrik Hedman in DragonSpeed #21 couldn’t keep the same speed as his younger teammate Allen, so he quickly fell back to third place in LMP2, while Duqueine Engineering #30 overtook the lead. BHK Motorsport #35 and Kessel Racing Ferrari #60 had a moment in the penultimate corner, where Francesco Dracone tried to dive past Claudio Schiavoni from the inside but he lost the LMP2 car on the curb and ended up in a little spin. There was a hard battle for third position in GTE between Dempsey-Proton Racing Porsche #77, Spirit of Race Ferrari #55 and Team Project 1 Porsche #56, where they pushed and shoved a little, but all three cars survived without any scratch. IDEC Sport #28 Paul Lafargue had a spin in Turn 5, but he kept second place in the LMP3 category. Nielsen Racing #7 got a 10 second time penalty regarding their pitstop, when Colin Noble had used a bit too much asphalt outside track limits. Inter Europol Competition #34 got a drive-through penalty because a tire technician was checking tire pressure while the car was being refueled. The regulation this year stated that you’re not allowed to do anything else while refueling the car, and afterwards you can repair or change tires or other stuff, but not at the same time. The lollipop man certainly noticed the error, as he gave a harsh reprimand to the tire technician from Michelin, already when the car left the pit – before the penalty was announced. M Racing #19 and Team Project 1 Porsche #56 had a close moment, where #19 ended up across the track. But Laurent Millara could quickly continued. Realtime Racing #9 and their LMP3 class colleague from Inter Europol Competition #14 came a bit too close to each other in Turn 6, where #9 had to avoid the other car through the run-off area, but they came out of it unscathed. 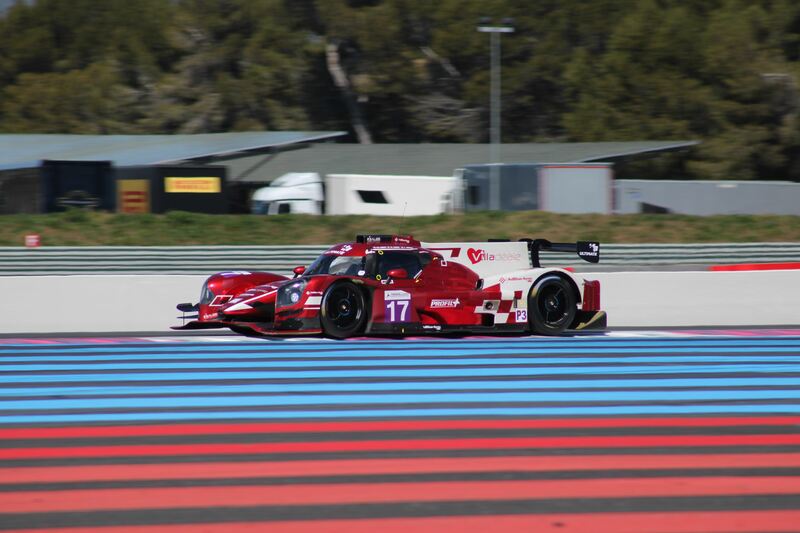 One and a half hours into the race, IDEC Sport #27 got a puncture on their left rear tire at the end of Mistral Straight, but luckily it was before he reached the fast Turn 8. The team reported about a brake problem on the car, probably as a follow-up damage. So the car once again got pushed to the garage, to top the hard week the team had had. After checking the car thoroughly, they chose to park the car and not continue the race. 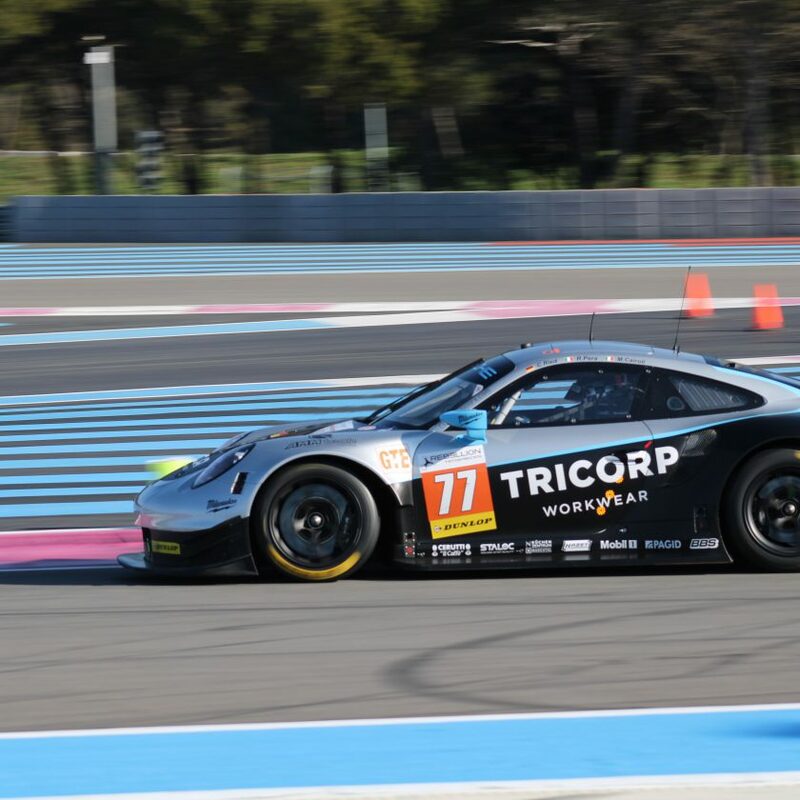 Jeff Segal in JMW Motorsport Ferrari #66 and Riccardo Pera in Dempsey-Proton Racing Porsche #77 had a drag race duel down the Mistral Straight – one which the Ferrari won. 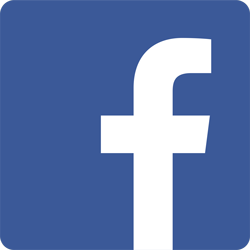 Halfway into the race, Duqueine Engineering #30 led LMP2, ahead of G-Drive Racing #26 and United Autosports #22 – Eurointernational #11 with Mikkel Jensen was still leading LMP3, followed by Realtime Racing #9 and Nielsen Racing #7. Luzich Racing Ferrari #51 with Fabien Lavergne, who had been driving the first part of the race by himself, led the GTE class ahead of Dempsey-Proton Racing Porsche #77 and JMW Motorsport Ferrari #66. There was a bit of commotion at the pit entry, where two LMP2 cars RLR MSport #43 and Graff #39 were about to collide, which forced Oregon Team #10 to brake really hard so that Damiani Fioravanti spun and lost a position in LMP3. Luzich Racing Ferrari #51 had to get a repair when their front bumper was hanging and flapping in the wind, after an earlier contact with United Autosports #32. The mechanics must also put a new mirror on the car, as the race director demanded. Luckily, they had a huge gap and still came out in front of the class. IDEC Sport #27 got a drive-through penalty for speeding in the pitlane – a penalty they couldn’t serve, since the car never made it back to the track. United Autosports #32 had a drive-through for overtaking outside track limits. It didn’t get better when Ryan Cullen spun shortly afterwards – could be because he got the message over the radio and was a bit distracted. Graff #39 was penalised for the weird drive at the pit entry earlier in the race, when Jonathan Hirschi drove past the write line. 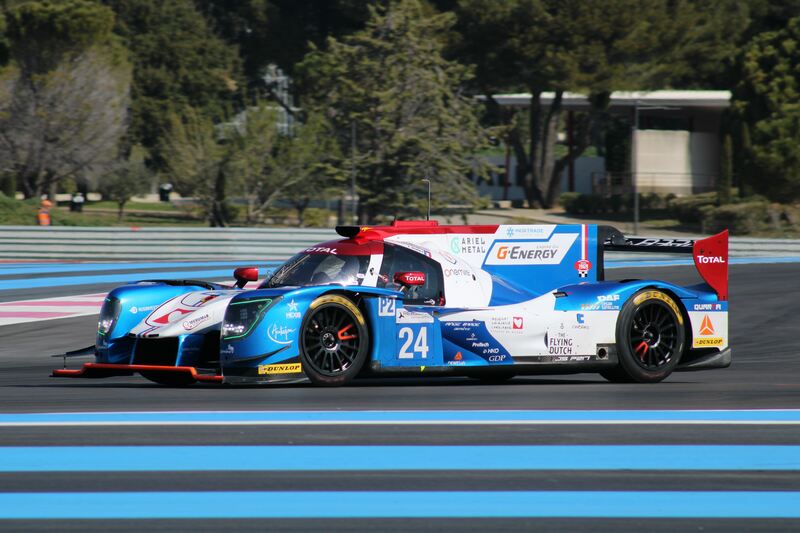 It gave Hirschi a drive-through, and he fell back to fourth place in LMP2. A costly mistake. 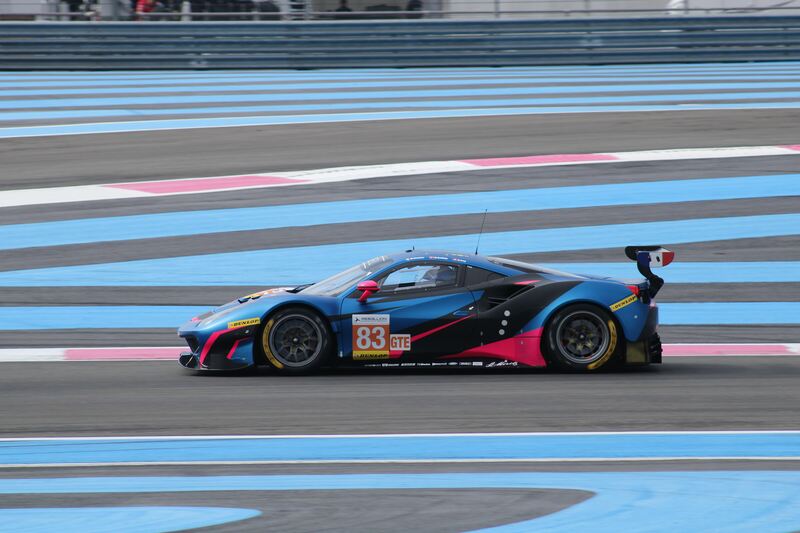 Kessel Racing Ferrari #83 with Rahel Frey drove up to second place in the GTE class, where she pulled away from Christian Ried in Dempsey-Proton Racing Porsche #77 with over a second per lap. On the way up the field, Frey also set the fastest laptime in GTE so far. Wei Lu in JMW Motorsport Ferrari #66 duelled with Christian Ried on the track, where Lu drove past once again and was up to third place in GTE. Graff #39 had to change the rear part of the car for missing one of the backlights. 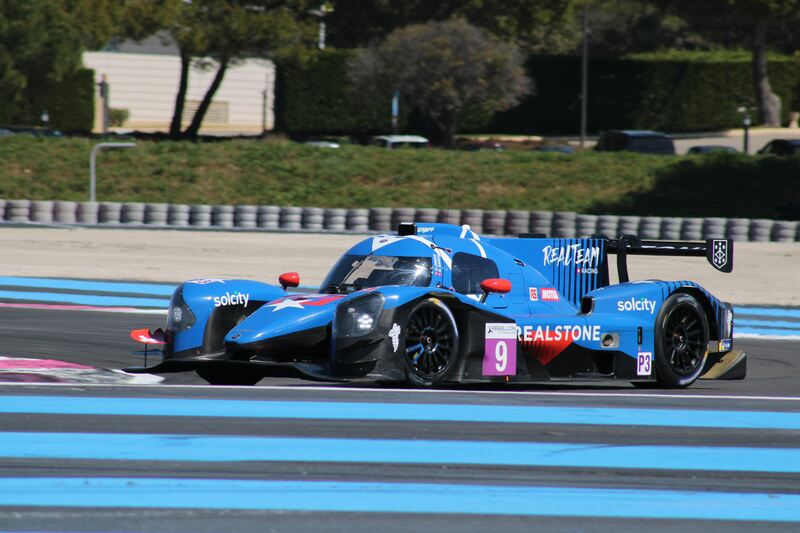 Fortunately it’s an easy task on an LMP2 car, but it would still cost a few valuable seconds. Martin Rich had a solospin in RLR MSport #15, on the way into the last corner and lost about fifteen seconds before coming back to the track. Paul Loup Chatin in IDEC Sport #28 fought to drive past Norman Nato in G-Drive Racing #26, with a nice overtaking in Turn 9, where Nato couldn’t keep the line and drifted out instead. Nobuya Yamanaka had a couple of slower laps, where he took Turn 4 straight, and shortly after that he came in contact with Rahel Frey in Kessel Racing Ferrari #83. Algarve Pro Racing #25 was close to hit Oregon Team #10 in Turn 5, but managed to avoid it by the skin of its teeth. The last hour of the race started with DragonSpeed #21 in the lead in LMP2, Eurointernational #11 in LMP3 and Luzich Racing Ferrari #51 in GTE. Michelle Gatting took over Kessel Racing Ferrari #83 in the last 48 minutes of the race, with the task of keeping the second place until chequered flag, or even catching up the 20 seconds to the class leader. 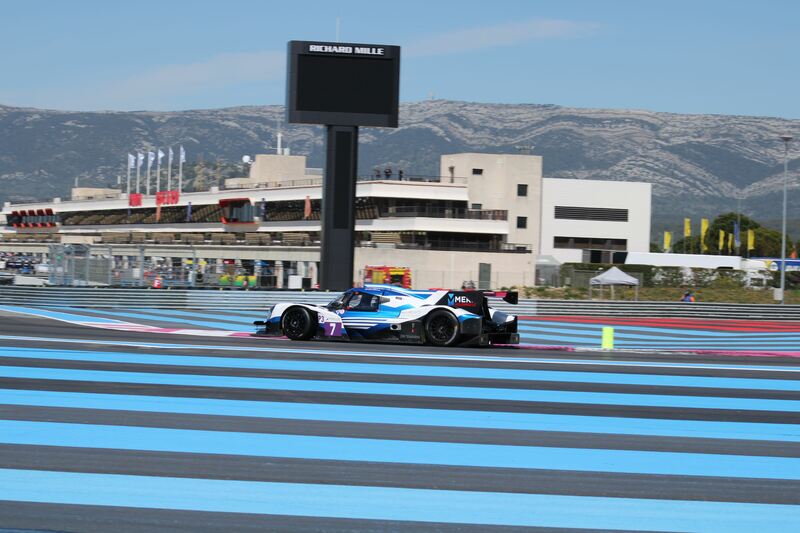 With 40 minutes left on the clock, things got exciting regarding the lead of LMP3 after Eurointernational #11 being superior through the first hours of the race. Ultimate #17 with Matthieu Lahaye began to catch up on Jens Petersen in #11, with a couple of seconds per lap. Fjordbach seemed to have some problems with High Class Racing #20 in the last part of the race. He had to let some competitors pass since he couldn’t get the same laptimes out of the car as the competitors could. He lost a couple of laps and chose to pit for new tires. 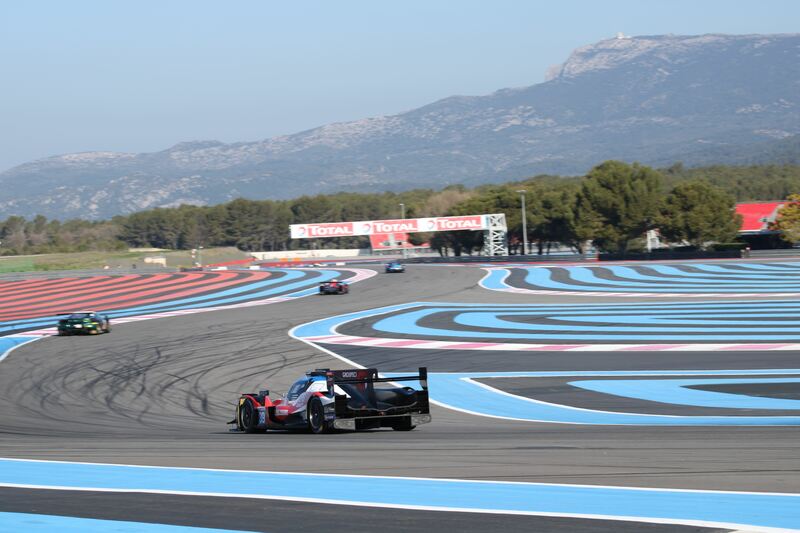 Half an hour before the finish, there was a lead change in the LMP3 category, when Ultimate #17 went past Eurointernational #11. Pitting for new tires for Fjordbach proved to be the right thing to do, and he slowly but surely crawled back up to top ten. There was also an indication for a soon position change in LMP2, where Norman Nato in G-Drive Racing #26 got slowly caught up by Richard Bradley in Duqueine Engineering #30, and 22 minutes before the chequered flag the change happened, so #30 was up in P3. A drama happened for Team Project 1 #56 when Jörg Bergmeister drove a punctured Porsche into the pits. From being in front in GTE in the first part of the race, now down to eighth place. There was excitement about third place in LMP3, where Oregon Team #10 with Gustas Grinbergas caught up with Tony Wells in Nielsen Racing #7. 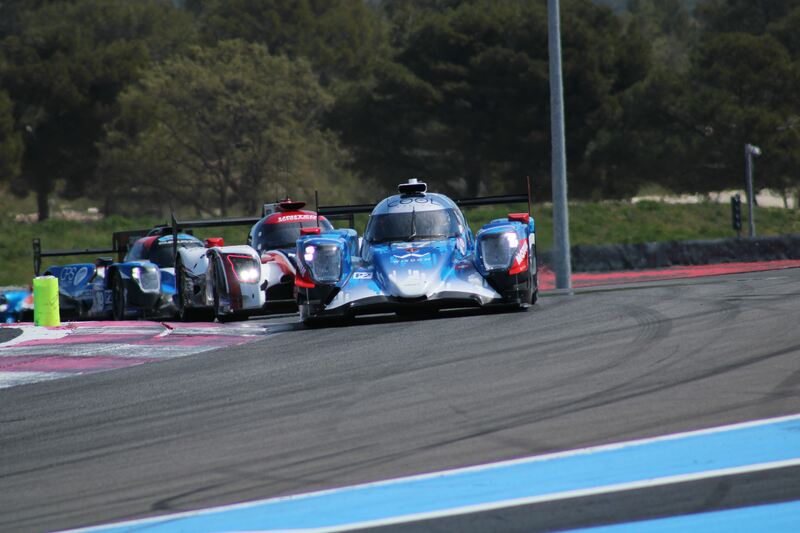 The two fought it out through traffic and at the same time had to let LMP2 cars pass without losing too much time. Panis Barthez Competition #24 with Konstantin Tereschenko had a wild spin in Turn 8, the Signes corner, and lost more than ten seconds before he could continue. Wells in Nielsen Racing #7 couldn’t keep the speed and fell back behind both Oregon Team #10 with Grinbergas and Inter Europol Competition #13 with Nigel Moore blowing past. 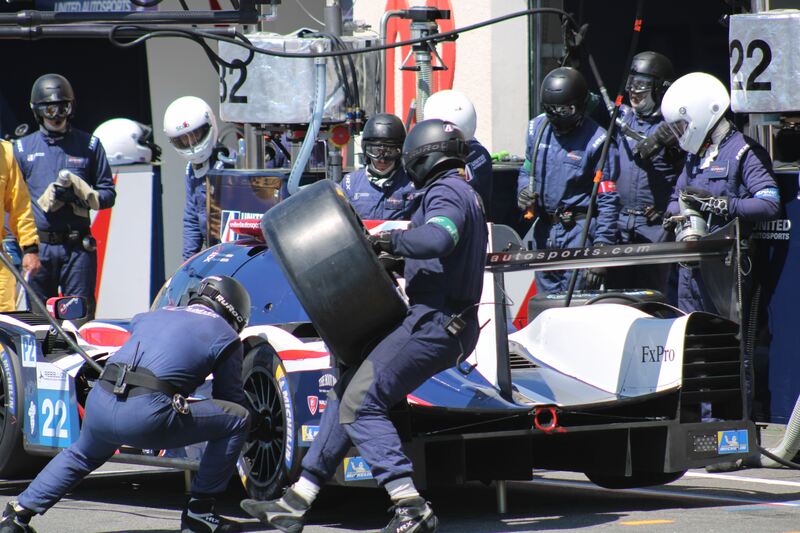 There was panic at United Autosports with five minutes left, when both their cars had to pit due to punctures. It costed a top five position for #22 with Paul Di Resta and Phil Hanson, while #32 with Ryan Cullen and Alex Brundle was out of top ten. 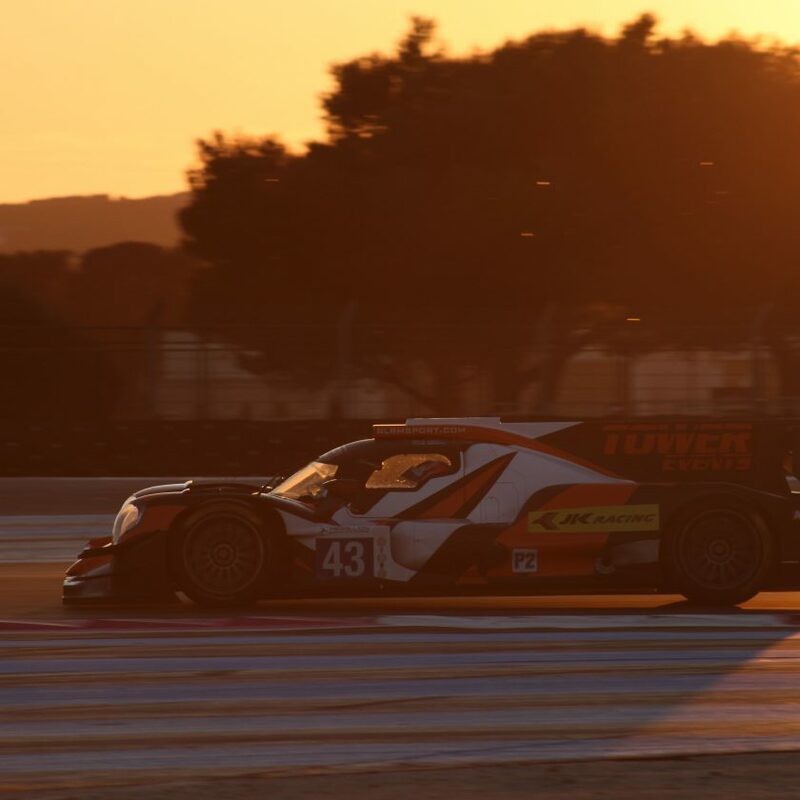 Panis Barthez Competition #24 and Algarve Pro Racing #31 came in contact with each other, in the battle for P13, and #24 ended up with a spin and crawled to the finish with a puncture. However, Tereschenko made a mistake by driving to the pits and not crossing the finish line, and thus the team wasn’t classified and got listed as DNF on the result. The stewards gave #31 a drive-through, which was converted to a 35-second time penalty, since they thought Henning Enqvist was the one responsible for the incident. 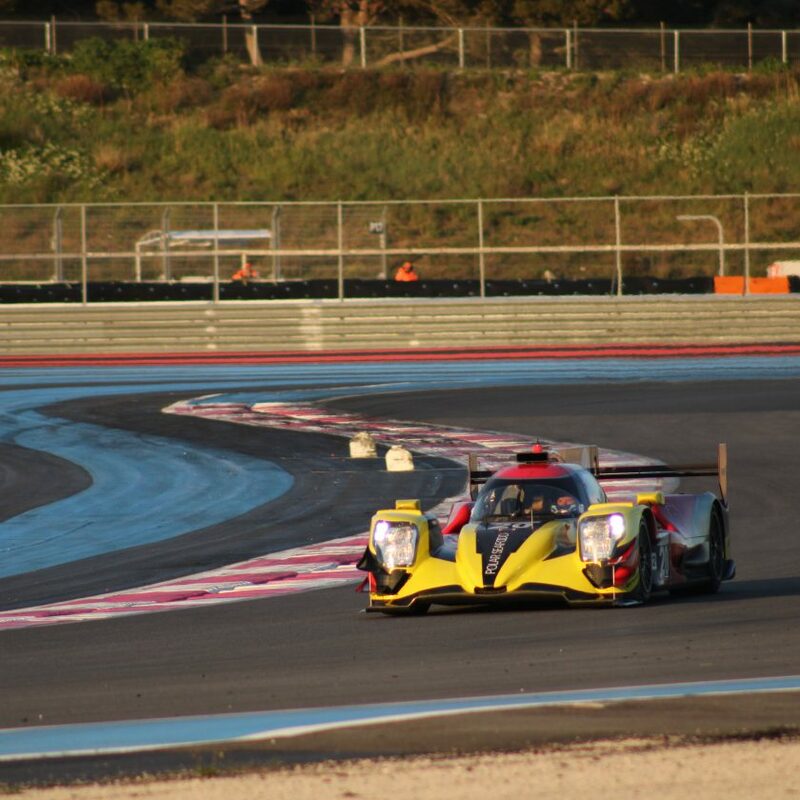 DragonSpeed #21 with Henrik Hedman, Ben Hanley and James Allen won LMP2, ahead of IDEC Sport #28 with Paul Lafargue, Paul Loup Chatin and Memo Rojas, and Duqeine Engineering #30 with Nicolas Jamin, Pierre Ragues and Richard Bradley in P3. 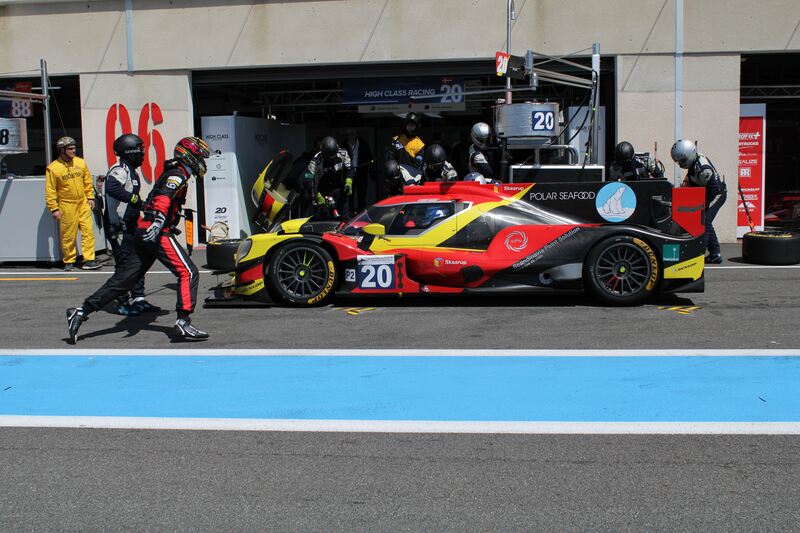 High Class Racing #20 with Anders Fjordbach and Dennis Andersen finished P9 in the LMP3 category. 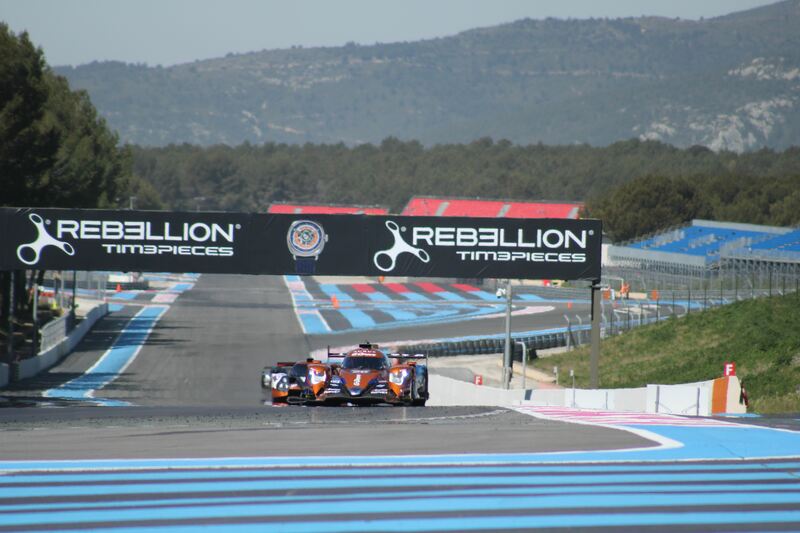 Ultimate #17 with Jean-Baptiste Lahaye, Matthieu Lahaye and Francois Heriau won the LMP3 category, in front of Eurointernational #11 with Mikkel Jensen and Jens Petersen, with Inter Europol Competition #13 Martin Hippe and Nigel Moore in third place. 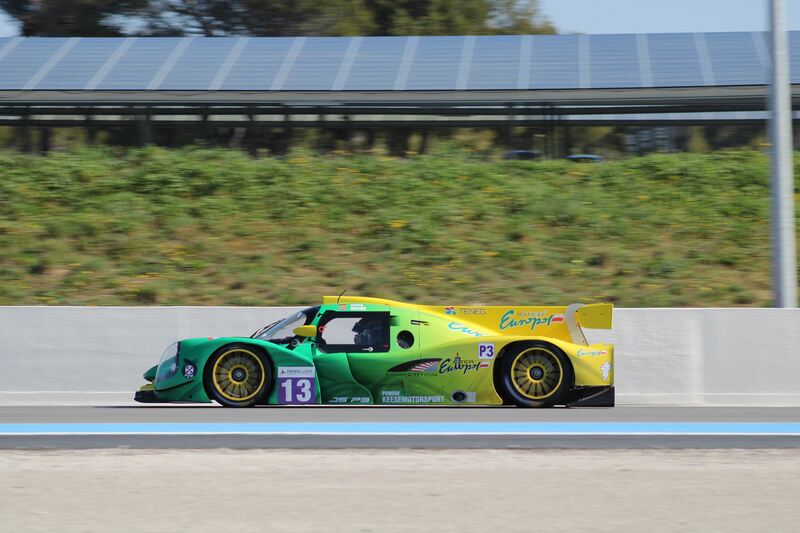 RLR MSport #15 with Christian Stubbe Olsen, Martin Rich and Martin Vedel Mortensen finished 12th in the LMP3 class. Luzich Racing Ferrari #51 won GTE with Nicklas Nielsen, Alessandro Pier Guidi and Fabien Lavergne, ahead of Kessel Racing Ferrari #83 with Michelle Gatting, Manuela Gostner and Rahel Frey, and Dempsey-Proton Racing Porsche #77 with Matteo Cairoli, Riccardo Pera and Christian Ried. That was the finish of a fantastic race, where the positions changed until the very last minute. The next round of European Le Mans Series will be run at Autodromo Nazionale di Monza on 12 May 2019.